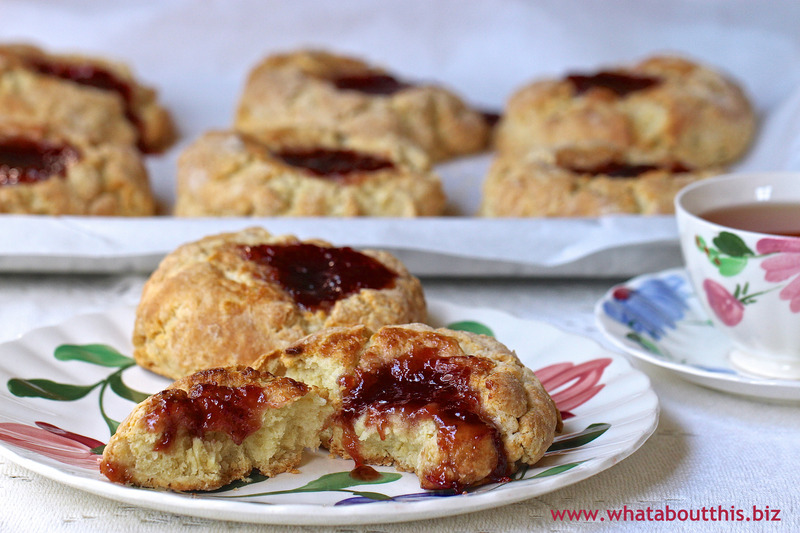 Grand Central Bakery Jammers: Biscuits Topped with Jam | What about this? Imagine the smell of homemade biscuits wafting throughout your home in the early hours of the morning. You wake up early, before everyone else, because you enjoy the peace and calm of your empty kitchen. The timer rings and you take a tray of jammers, large buttery biscuits topped with jam, out of the oven. You restrain yourself from taking a bite into one, because you know that they will reach perfection in about five minutes. That gives you just enough time to brew a mug of coffee or steep a cup of tea. You eye the clock as five minutes turns into an eternity. Finally, you sit down with your hot brew and stare at the plate of jammers. You carefully select the largest one that has the biggest glob of jam on top. And after only one bite, pure delight spreads across your face as the crunchy exterior yields to the soft flaky interior. Ah, there’s no better way to start the day than with a hot jammer! 1. Preheat the oven to 350 degrees F. Lightly grease a baking sheet or line it with parchment paper. 2. Measure the flour, sugar, baking powder, salt, and baking soda into a bowl with high sides or the bowl of a stand mixer and whisk to combine. 3. Dice the butter into 1/2-inch cubes. Use your hands or the paddle attachment of the stand mixer on low speed to blend the butter into the dry ingredients until the texture of the flour changes from silky to mealy. There should still be dime- to quarter-size pieces of butter remaining. If you’re preparing the dough the night before, cover the bowl with plastic wrap and chill overnight; otherwise proceed with the recipe. 4. Make a well in the flour mixture and pour 1 cup of the buttermilk in one addition. Gently mix the dough just until it comes together; it will look rough. Scrape the dough from the sides and bottom of the bowl, then add another 1/4 cup buttermilk and mix again to incorporate any floury scraps. The majority of the dough will come together, on the paddle if you are using a stand mixer. Stop mixing while there are still visible chunks of butter and floury patches. The dough should come out of the bowl in 2 to 3 large, messy clumps, leaving only some small scraps and flour around the sides of the bowl. If the dough is visibly dry and crumbly, add up to 1/4 cup more buttermilk, 1 tablespoon at a time, mixing no more than one rotation after each addition. 5. Turn the dough out onto a lightly floured surface. Use the heels and sides of your palms to gather the dough and gently pat it into an oblong shape 1½ to 2 inches thick. It won’t look smooth or particularly cohesive; that’s okay. Use a biscuit cutter to cut jammers into circles at least 2½ inches in diameter. Layer the leftover scraps on top of one another and gently pat them out to a thickness of 1½ to 2 inches and again cut into circles. 6. Use you thumb to make an indentation the size of a fifty-cent piece in the middle of each biscuit. While gently supporting the outside edge of the biscuit with your fingers, use your thumb to create a bulb-shaped hole that’s a bit wider at the bottom and that goes almost to the bottom of the biscuit (think pinch pot). Try to apply as little pressure as possible to the outside of the biscuit, to avoid smashing the layers, which are the key to flaky jammers. 7. Fill each indentation with 1 tablespoon of jam and put jammers on the prepared baking sheet with 1½ inches between them. 8. Bake for 35 to 40 minutes, rotating pan halfway through the baking time. The jammers should be a deep golden brown. 1. These are very large biscuits! I was only able to make 8 biscuits from the recipe. 2. The key to achieving a flaky biscuit is to keep the butter cold and to avoid overworking the dough. 3. I baked my jammers for 35 minutes in a convection oven and they were done perfectly.